Charles Whiteley married Phoebe Hopper in 1877 in Maryborough, Victoria. 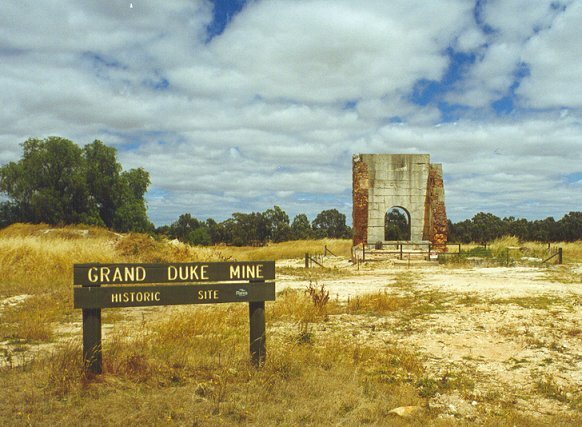 Charles worked in the local Duke Mine in Timor, and it was this occupation which was to lead to his accidental death. The following is an account of the accident as reported in the local newspaper on the day it happened. One of the most terrible accidents which has occurred in this district for years happened at the Duke mine, Timor, this morning. The eight o’clock shift was going on, and four men, names James Rogan, John Rogers, William Jones and Charles Whiteley, stepped on to the cage, which was standing at the mouth of the shaft. Several others miners also, who had just come from below, were standing around, and also a braceman named Doyle. A young miner, named Metcalfe, had intended to go down, but he stood aside to light his pipe, and Jones went down in his place. The signal was giving by Doyle to lower away, and the machinery was set in motion, but to the alarm of everyone the cage darted up towards the brace. Doyle pulled the signal frantically to warn the driver of his fearful mistake, and the miners in the cage called out to stop, but no attention was paid to them, and the cage was hauled violently against the poppet heads. The chain broke, and the cage with its living freight descended with arrow-like celerity to the bottom of the shaft, 338 feet below. Directly the accident was known, the engine driver, John Jones, was questioned as to why he did not answer the signals, but the man seemed utterly unable to reply coherently, and could merely give the mining manager, Mr Griffiths, generally to understand that some one got in his light, so that he could not see the shaft at the critical moment and he became so confused that he did not know what to do. The driver was then allowed to leave the engine, and another engineer lowered Mr Griffiths and the captain of the shift, Mr Wills, down the shaft. They found the men smashed to pieces amongst the debris of the cage, and under the manger’s direction four trucks full of mangled remains were sent to the surface. One man’s limbs could scarcely be recognised from those of another. Very little was left of Whiteley’s head, and Rogers was the only body recognisable. The blood was flowing from the trucks in a sickening stream. Anxious crowds soon gathered round the shaft, and through the midst of the awe-stricken people the remains of the deceased were taken to the changing house. All work was suspended for the day by order of Mr Griffiths, and out of respect to the deceased miners the company’s flag was lowered to half mast. Jones, the engine driver, went home and appeared to have become quite deranged from an overwhelming sense of his fatal error. He is reported by Mr Griffiths to have been previously a most careful driver, and to have been many months in employment of the company. The only thing that is alleged in justification of the accident is a theory that his mind was off its balance through religious mania, which he has developed since attending the meetings of the Salvation Army. The three deceased miners, Jones, Rogan and Rogers, were single men, but the fourth, Whiteley, leaves a wife and five children. Rogan had a mother, sister and brother partially dependant on him. Everything was in good order, both as regards the ropes,shaft and machinery, and the manager states that the driver, had he chosen, could have turned on a brake which was powerful enough to stop the cage at once. Allan’s safety hook and the grippers were attached to the cage, but although the hook is said to have acted well, the grippers only clutched once, and then ineffectually, when the falling cage was about 100 feet from the surface. 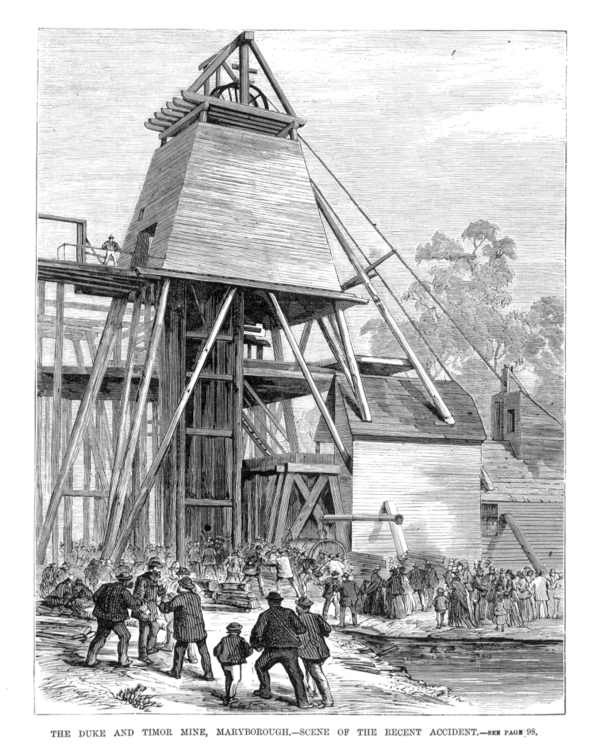 According to ‘The origins of Victorian mining technology, 1851-1900’ by Christopher J Davey: ˜The most successful cage seems to have been designed and made by Robert Allan of Creswich in 1876. There are only three recorded occasions when an Allan cage failed to work in an emergency, one being on 18 December 1883 at the Grand Duke Co, Timor when the cage went to the shaft bottom with four men who were all killed. Some designs failed to act with monotonous regularity, supporting a common belief that it was more important to maintain equipment properly than to rely on poorly kept safety gear. Safety equipment remains common on cages used in the industry, but the contribution to its development from Victoria is unclear. Incidentally, the newspaper account states that Charles left a wife and five children. In fact, when Charles died his wife Phoebe was pregnant with their fifth child, Alice Beatrice, who was born on 21 July 1884, seven months after Charles was killed. Want the full story? Read transcriptions of the original newspaper reports into the accident itself, and the subsequent inquest and eventual conviction for culpable negligence & manslaughter.